Like most waterways in the Midwest back in the 60’s/early 70’s, the Saginaw River has had a checkered past. During these times it seldom if ever froze over during the winter. It would virtually steam and stay open even in the coldest winter conditions. Gone were the days when my grandfather told me that the ice would be 3 feet thick and thousands of shanties would be bank-to-bank fishing for the 3 P’s, Perch, Pike or Pickerel. Pickeral of course was his (Canadian ancestral) name for walleye, along with many other species he’d just a soon call Pickerel versus their real scientific name. The many industrial plants along the rivers length kept a steady flow of hot water and other less desirable components flowing into her and keeping the waters from freezing. All this has changed in these last 25 years, and even though it still takes a cold winter to freeze things over on the Saginaw River, it happens now quit frequently. You still have to consider that the Saginaw River system drains thousands of miles of other river systems that flow into it’s headwaters, so the sheer current mass alone keeps the river open during wet or thaw periods. But during hard freezes, seeing both shanties and snowmobile suit clad fishermen as far as the eye can see both up and down river, has become quit common. It is a beautiful site to behold. It is still possible of course, for those passionate about fishing to go out and make a catch. But the real fish catching fun doesn’t start then, it’s just punctuated then and allows anybody with a jigging rod a spud and a pail to set on, an easy access to some great fishing. 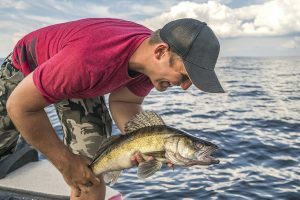 Because long before the ice sets in on the Saginaw river, the open waters of Fall, Spring and now even summer (for the most part) play host to a growing biomass of walleye, perch, bass, catfish and drum. All these species are finding the rivers habitat a lot more to their liking now that the waters have cleaned themselves up some. Like any system with a bounty of catchable fish in it, the techniques used vary and are many, depending on your intended prey and often the time of year you’re fishing for them. Few lures can beat the sheer numbers of fish caught through the ice on the Saginaw than the Jigging Rapala. Jigged near bottom, with a morsel of minnow meat hooked to the belly hook of the lure, and your chances for success are greatly increased. And during the open water seasons few things beat a Jig and Minnow offering. 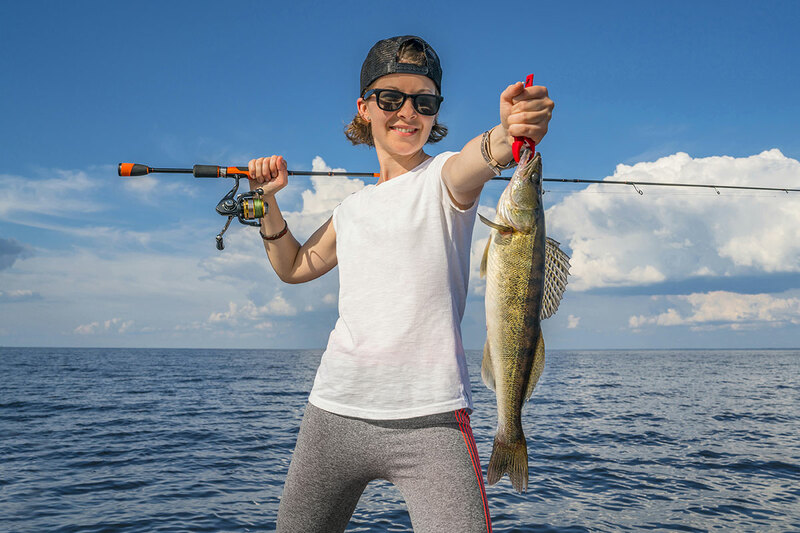 Jigging the right sized weighted tidbit straight up and down letting it hit bottom, while slowly drifting in complete unison with the current, catches the majority of all the specie available, especially walleyes. Trolling crank baits like the Dave’s KaBoom Winning Streak, the Storm ¼ ounce Hot-N-Tot or the Rapala #7 Shad Rap all take their share of walleyes during the day and some real monsters during the night time. And if it’s bass you like, the spring and summer fishery on the Saginaw River may be the most under-utilized fishery going. Spinner baits, tubes and a variety of smaller cranks take some impressive smallies and a few large mouths all summer long when fan cast along the old piles-on’s, bridge abutments, docks, ship turn-around’s and rock rip-rap that lines the shorelines for miles on both sides. It may be that there is just too much cover to fish, it’s that good. 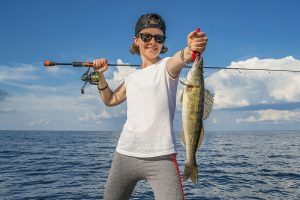 And during these times its nothing to pick up a giant freshwater drum, channel, blue or flathead catfish using the same things you are for bass or walleyes, the fishery has become that diverse. The key to the very best times too catch fish seems to be both water temperature and forage availability. And without a doubt, the spawning cycle has a lot to do with the walleye fishing success. In my experience the months of November and December are the best times to intercept a truly big walleye. Many of the spring spawners come into the rivers early, fallowing the forage looking for warmers river waters themselves. 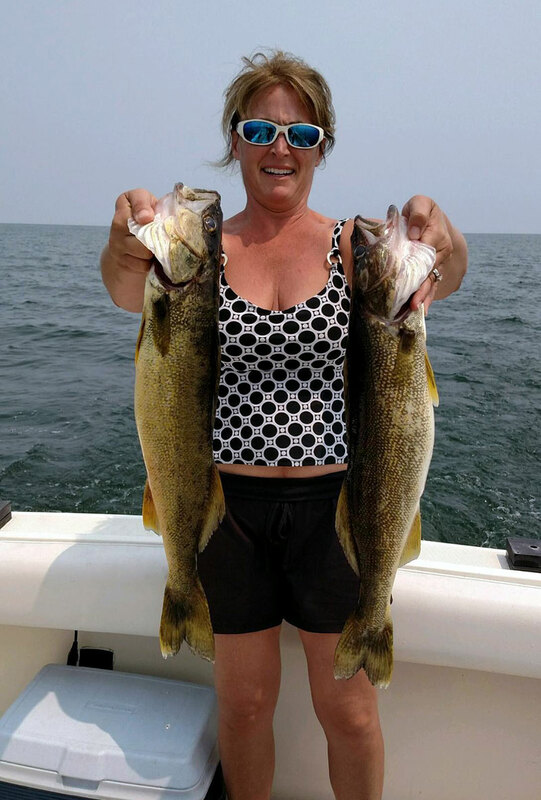 The spring fishery is also good, but the legal walleye season re-starts almost to late to intercept the spawned out females before they drop back out of the river and back into the Saginaw Bay system. So many of the fish caught are the smaller 2 to 3 pound male holdovers. Of all the water quality and revived fishery success stories to come along in recent years, the Tittabawassee River might well take top trophy for her turn-around if one was offered. But unlike her sister rivers, the Bad, Flint, Shiawassee, Cass and Chippewa (that drain literally thousands of square miles of West central Michigan, and in turn all flow into the Saginaw River at her headwaters) her simplistic charm and natural beauty has never left her, even when the river turned out nothing but Un-eatable fish during the 60’s, 70’s and early 80’s. But now, she welcomes and nurtures thousands of spawning walleyes every late winter into spring, as well as their offspring after they hatch. Her twisting wooded shorelines, sand and occasional gravel strewn bottom is perfect habitat for river run Walleyes, White Bass, Pike, some Largemouth and many Huge Smallmouth bass. Virtually every freshwater species know to the Great Lakes can be found in varying numbers during certain seasons up in the Tittabawassee River. The only true downside to this gem is her unfriendly attitude towards any boats larger than 17 feet and sporting motors with long shafts. The Tittabawassee by nature is very shallow and dangerous even during medium and high water intervals. Long stretches of water one foot deep is not uncommon. Many hazards from ancient bridges that were abandon from the old days are still there. And with many of the new structures erected both up and down river from the old existing ones, all the old cement supports, pier heads, pile-ons and (in some cases) super structures themselves, are abandon but still standing. There is also very few launches on the 28 miles of river I like to fish from it’s convergence with the Saginaw River, up-stream to the Dow Spillway Dam in Midland. Most of these launches fill in with sand during the spring floods or stay to shallow in general to safely launch a decent sized boat. I new long ago if I wanted to fish and charter on this river exclusively, I better purchased a Boat for the job. 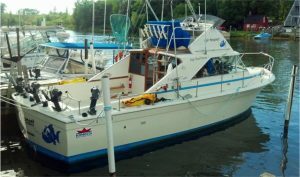 So I bought a flat bottom river boat with a Yamaha Jet Drive outboard. But even I have had a few unseen bumps along the way these last 18 years of fishing the Tittabawassee. 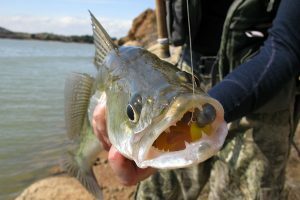 As far as techniques go, nothing beats a Jig and Minnow cast while anchored or hopped while slipping the current, for every specie of fish swimming in the river. I’ve caught everything from fall salmon and steelheads to spring White bass and catfish on this type offering and technique. The key is finding and recognizing the preferred holding areas of each specie during each season or in each fluctuation of the water table. Holes, slots, deep runs or wing dams all hold fish at some point. Its when the water fluctuates that some of these spots get better or worse during certain intervals, during wet or winter thaw periods or when the Sandford Dam is releasing or holding water back from Sandford Lake, well upriver of the Dow Spillway. Once one has a handle on the tricky nature of this great river, it can supply you with some real fishing memories.